For the first time ever, the US Air Force’s X-37 unmanned space plane has gone into orbit on a mission not entirely classified. The USAF provided details on several civilian experiments aboard the drone shuttle, though much of the mission remains secret. This is the fourth mission for the space drone, known as the X-37B. It launched Wednesday morning at 10:45 a.m. local time, from Cape Canaveral Air Force Station in Florida, on top of an Atlas V booster rocket. On the previous mission, the drone shuttle spent 674 days in orbit. There is no word how long this mission will take. The X-37B is a smaller, unmanned version of NASA’s retired Space Shuttle, built by Boeing and operated by the US Air Force. Two vehicles have been officially acknowledged to exist. “The test mission furthers the development of the concept of operations for reusable space vehicles, and fine-tunes technical parameters for an affordable, reusable space vehicle,” Air Force spokesman Captain Christopher Hoyler told the New York Times. Though previous flights of the space drone have been entirely secret, the Air Force has released an unprecedented amount of information about Wednesday’s launch. In addition to vehicle tests, the X-37 is carrying pods intended for several civilian experiments. NASA is using the X-37 to test the reaction of almost 100 materials to space exposure, radiation and temperature swings. Among the materials are thermal coating intended to maintain spacecraft components within a certain temperature range, special ink to be used for markings on spacecraft parts, and clear materials intended for use on Orion crew capsule windows. Miria Finckenor, a materials engineer at NASA’s Marshall Space Flight Center in Huntsville, Alabama, and lead investigator for the experiment, told the New York Times the pod would be exposed to the environment for at least 200 days. “This opportunity presented itself, and we just needed to take advantage of it,” Finckenor said. Another experiment is LightSail, a “solar sail” developed by the civilian nonprofit the Planetary Society. The compact device is supposed to deploy four booms and unfurl triangular Mylar “sails” that would catch sunlight and turn it into propulsion. Superficially resembling the retired Shuttle, the X-37B is 29 feet (8.8 meters) long by 9.5 feet (2.9 meters) tall, with a wingspan of 15 feet (4.6 meters). Its payload bay is the size of a pick-up truck bed. 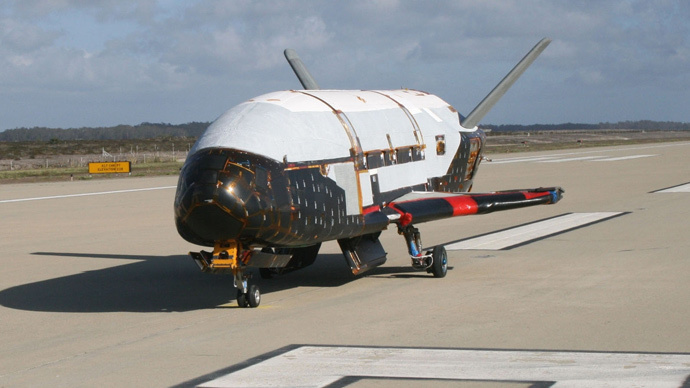 Since April 2010, the two X-37B space drones have clocked 1,367 days in space over the course of three missions, according to Space.com. The existence of a space program operated by a branch of the US military has prompted concerns over the militarization of space. While the X-37 is not well-suited to a weapons role, most of the program’s details remain classified, “so it still seems to be a source of anxiety for some of those concerned about the increasing weaponization of space," Laura Grego, of the Union of Concerned Scientists, told Space.com. Contrary to Boeing’s claims, it is not the first unmanned vehicle to return from orbit and land by itself. The Soviet Union’s version of the Shuttle, called “Buran,” did so in the 1980s. Russian President Boris Yeltsin canceled the Buran program in 1993, and the only operational vehicle was destroyed in 2002, when the roof of the hangar at Kazakhstan’s Baikonur spaceport collapsed.